Though carnations are commonplace in floral arrangements, this ubiquitous flower has a long and storied history. In Greco-Roman times, carnations were frequently portrayed in art and painted or sculpted onto household items as decorations. They were also fashioned into garlands worn on festive occasions. Throughout the early and middle ages, carnations were grown for their clove-like scent as well as their pale peach and pink blossoms. Gardeners eventually cultivated many colors of carnations and with their cultivation came new symbolic meanings attached to their colors. Red, for example, came to symbolize deep love and affection, while a light red or pink carnation, merely affection. Today, the carnation often surpasses the rose as a flower given to others as a gift. Worldwide, more carnations than roses are sold and offered as love tokens, remembrances of loved ones, or bouquets to cheer someone’s spirits. Carnations are versatile, inexpensive and long-lasting flowers that connote positive associations in most cultures. Standard or large-flowered carnations – The flower heads are about the size of a closed fist. One flower tops a single stem. Carnation sprays – Sometimes called mini carnations, sprays feature multiple small flowers on side stems off of a single thicker stem. Dwarf-flowered carnations – Dwarf-flowered carnations are similar to carnation sprays, but the flowers are much smaller than on the sprays, with some flowers barely larger than a typical U.S. quarter coin. Florists generally use standard or carnation sprays in arrangements and bouquets. Carnations are used in bouquets and arrangements, but they aren’t limited to these options. Florists have found ingenious ways to use carnations. Single flowers can be floated in bowls of water with a floating candle for table centerpieces. Bouquets of carnations can be tied with raffia or ribbon for informal wedding bouquets. Carnations are used as either accent flowers or in a bunch as statement-making flowers. While some florists may view them as old-fashioned, out of date flowers to use in arrangements, these new methods of using carnations give them a modern feel, and take away some of the dated feeling that using a triangular spray of large carnations can give an arrangement. 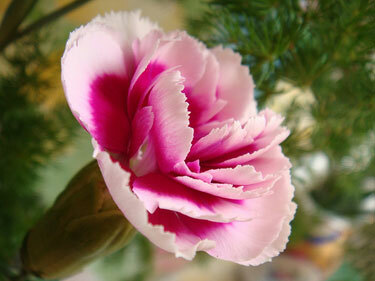 Purchase carnations with tightly closed buds and blossoms. Make sure that the stems aren’t split, bent or broken, which can shorten the flower’s life. Avoid open flowers with the pistil exposed above the blossom. After purchasing carnations, remove the foliage that will be below the water line. Use a sharp knife and cut the stems under water. Place them in a solution of warm water and floral conditioner for about two hours before refrigeration. Keep refrigerated at 36 to 38 degrees F. Carnations are ethylene sensitive and last about 7 to 14 days with proper care and handling. Standard or large-flowered carnations cost approximately $1 a piece, or $149.00 USD for 150 flowers. Miniature or spray carnations cost approximately $189 for 250 stems or 25 bunches. In the United Kingdom, large or standard sized carnations are £0.64 per stem, and sprays are the same price but sold in batches of 10. Carnations are available year-round, with little seasonal fluctuation in price.